Think simple & go happy. Introducing the Go Happy Travel Tray. We get it. Traveling with kids takes work! Finding good alternatives to screen time AND germ-free surfaces while traveling is tough! Let the Go Happy Travel Tray help — give kids a clean, contained space to play, create and eat in the air. Made with BPA-free, PVC-free, phthalate-free, FDA & EU food safe approved ABS plastic. Includes a removable, food safe, easy to clean, grippy silicone liner — eat & play on a clean surface. The 15 x 11” firm tray and raised border offers kids their own special contained space to play & create with whatever keeps them engaged. The ABS plastic surface also functions as a dry erase whiteboard with most non-toxic dry erase markers. 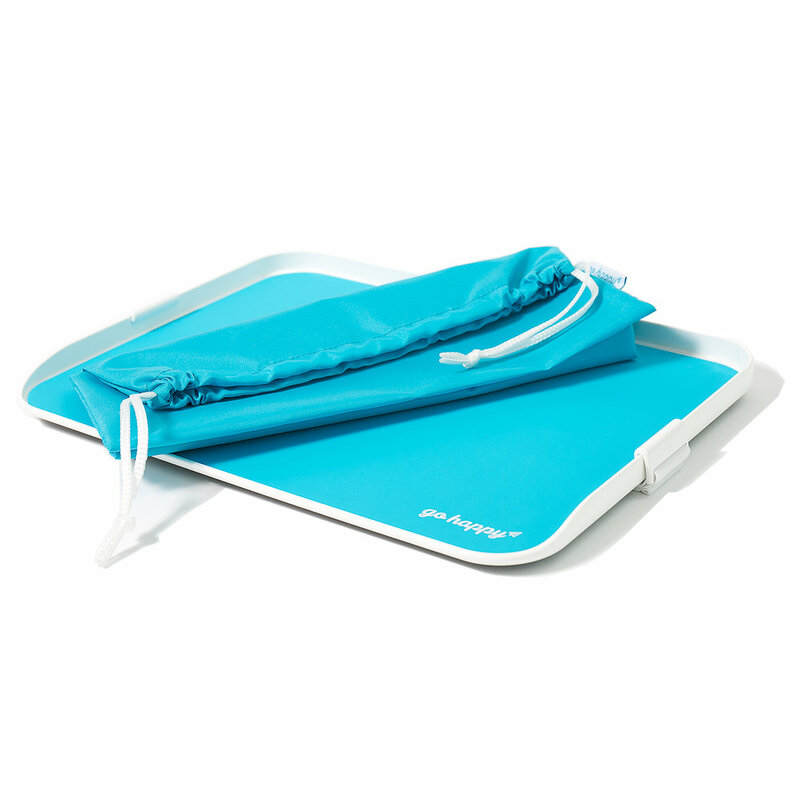 The grippy bottom surface and optional adjustable strap help the tray stay put on plane & train tray tables. No more food, toys, crayons, etc. on yucky floors! No assembly required. Nope, the tray doesn’t fold. The lightweight (1LB) no fuss design slips easily into backpacks or carry-ons, just like a laptop. Drawstring storage bag included. FIRM SURFACE NOT INTENDED FOR USE IN CAR OR WITH CAR SEATS. Just because it’s for kids doesn’t mean it can’t be stylish. Did we mention it works great at home and for adults too? Parent and patent approved! We are wired to connect — to each other. We believe travel, near or far, is one of the most beneficial experiences a child can have. The more they see of the world, the more they connect with the world, the better they make the world. The valuable time together always offers us a chance to reconnect with our kids too. Get out there and enjoy the adventure. Go Happy Kids is the partner you can rely on to help you and your kids become more confident, curious, connected travelers. Think simple & go happy!